Noblíssimo Interagro embodies the spirit, talent, and beauty of his sire, the famous Xique-Xique (CI). This stallion, along with two other extraordinary Xique-Xique (CI) sons Quínio and Quinárius Interagro, continue the legacy of their sire, the most important and influential of the Quina horses and chief among all the stallions to stand at Interagro. His offspring continue to exude the spectacular qualities of his their grandsire’s lineage, and have been awarded numerous prizes in both sport and conformational competition. Noblíssimo Interagro imprints his progeny with extraordinary gaits and athleticism combined with a docile and noble temperament, allowing them to excel in a variety of disciplines. 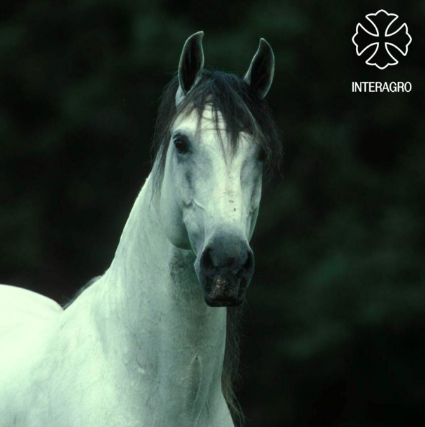 Noblíssimo’s dam, Cigana III (MLC) is the most influential and important conformational foundation mare in Interagro’s herd. Besides Noblíssimo, she has begotten a series of Gold Medal Champions and sires of greatly prized individuals: Profano Interagro (by Legendário do Mirante); Obtuso [by Yacht (SA)], an international dressage champion now in the U.S; and Rocinante [by Distinto (MAC)], all of which were bred by Interagro. Very much like Xique-Xique (CI), Cigana III (MLC) has definitively imprinted the Interagro lineage and will continue to do so through her sons and their offspring. The physical correctness and balance achieved by this extraordinary son of Xique-Xique (CI) is second to none. Champion of the 2-years and under colt class and Gold Medal winner of São Paulo’s International Show, Noblíssimo, along with his brother Obtuso Interagro, were also champions through Cigana III (MLC) in the dam’s-progeny class at the 1996 International Show. As descendant of older Veiga lineages and son of one of the most influential of Interagro’s mares, Noblíssimo is truly noble. 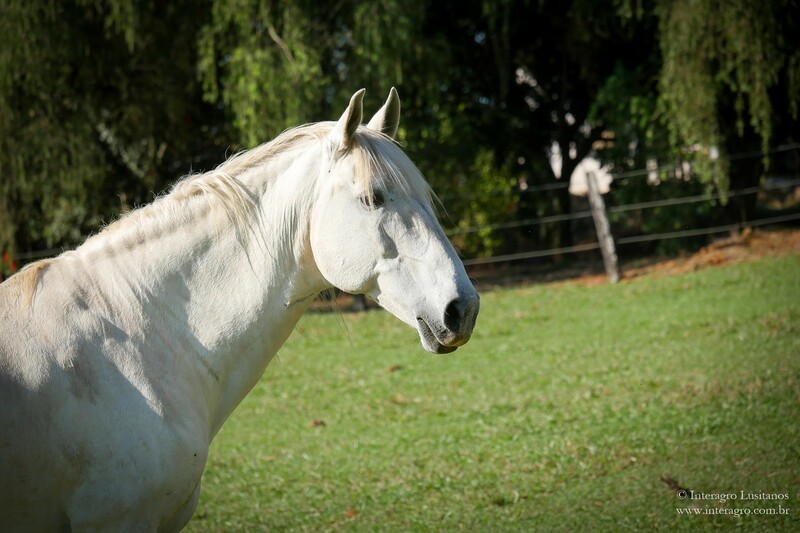 The offspring of this fiery and kind stallion inherit the most coveted and defining characteristics of the Lusitano breed: endless beauty and a proud demeanor. The successful performances and achievements of his sons and daughters are the best evidence of Noblíssimo’s quality and the continuation of Xique-Xique’s legacy. Noblíssimo’s first foal crop, Rhea and Rachel Interagro, were awarded Gold Medals at the São Paulo International Show in 1999. The second foal crop, which were exported to the USA, achieved impressive results at the 2000 International Andalusian and Lusitano Horse Association (IALHA) Nationals in Fort Worth, Texas: Thalia Interagro won Champion Filly and Thales Interagro won Champion Colt. Vade Mecum Interagro, a proven Grand Prix competitor, on the 2014 State Grand Prix Championships in Sao Paulo, as well as two CDI*** Grand Prix freestyles and has had top scores in the Grand Prix Special. Vade Mecum was sold in the US in 2015. Another young horse dressage champion, Baliel Interagro has also taken top prizes in conformation and working equitation. In Ecuador Toriba Interagro owned by Criadero El Altozano also won many Dressage tests.